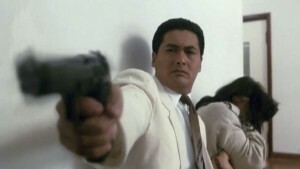 It’s clear why this movie is a classic staple of the Hong Kong action film genre, with its uber-violence and slow-motion gunplay choreography, but it doesn’t quite hold up so well today, as it lacks in plot, dialogue, and characters. This is one of the better John Woo Hong Kong action films, with it’s fantastic gunplay and slow-motion choreography. The problem is that the plot isn’t anything special and dialogue is often more hokey and corny than it is believable. Still, on an action level alone, this film is terrific. 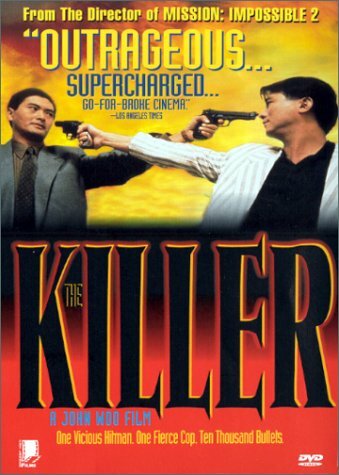 Chow Yun Fat is Woo’s muse and he’s got a knack for playing the killer with a heart of gold. The ideas at play with this storyline often feel a little too simple (the guys who hired him now want to kill him, just so they don’t have to pay him,) or a bit too confusing, (a middle man is suddenly brought in, about halfway through the film, just to have more characters,) but it’s not the story or characters that people watch this movie for. It’s the action. 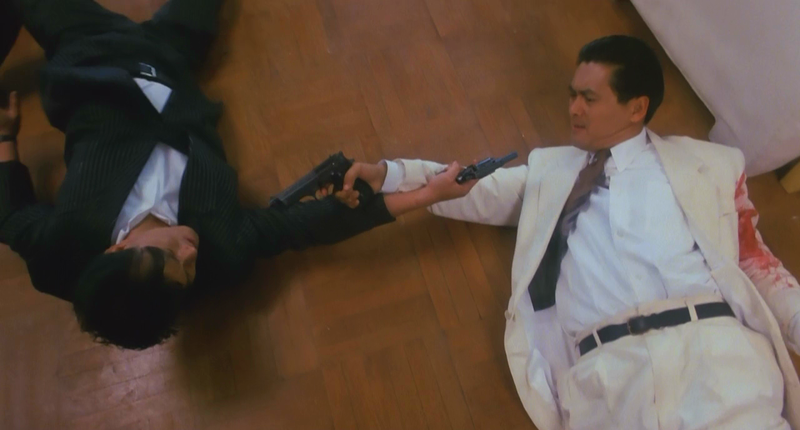 And nobody does gun action better than John Woo. The Killer is one of the classic John Woo directed Hong Kong action films. There are really only two of them, that are his most well-known. The Killer and Hard Boiled. After that, there’s another tier of these movies, (2 more films,) which are A Better Tomorrow and Bullet in the Head (all four films star Chow Yun Fat.) But it’s known among cinephiles and fans of the genre that when you talk about the best of John Woo, you’re talking about Hard Boiled and The Killer. The reason why is simple. The action. Woo choreographs his action like a ballet, with characters jumping and diving and rolling around as they fire off bullets. He uses slow motion as often as possible to show us exactly what’s happening in mid air, and how. It’s no surprise that the filmmakers behind the Matrix movies were huge fans of John Woo, when you think about their bullet time, and how much they were able to show us by putting things into super slow motion. John Woo’s movies were the inspiration for all that. The story line behind the Killer is kind of simple. An assassin (Ah Jong,) takes one last job. It’s to kill someone at a night club. In the process of killing his target, Ah Jong ends up blinding a waitress / singer, (Jennie,) who works there. Now, he feels bad and starts taking care of the woman. The assassin with a heart. On top of that, the guys who hired Ah Jong to kill the target don’t want to pay him and instead, decide that they would prefer to just kill him. So they start sending guys after him. Thats the gist of the plot. It is definitely too simple. Now, part of the reason why John Woo films work so well is because their plots are indeed simple. You watch them for the action, not the plot. And if the plot is easier to follow because of how simple it is, then all the better. It means you, the audience, can focus on the action more and not have to read subtitles as much. Only not this time. This time there are plenty of subtitles to be read, plenty of extra characters, and an even more simple plot than usual. In fact, this plot even borders on being pretty dumb. The assassin with a heart of gold idea is okay, but why are the guys who hired him suddenly coming after him? How about just pay him? When the entire plot of a movie rests on something as simple as that, where if the characters just did one thing, there would be no movie, you know there’s a problem. Here the movie tries to make things “seem” more complicated by bringing forth a whole storyline about Ah Jong’s money and the guy who negotiates between Ah Jong and the triad, (the one doing the job, and the ones paying the money,) in order to get it. It works in making things a little more confusing at times, but doesn’t exactly add to the story. Anything with the money is implicated just for the sake of being complicated and nothing more. And then there’s the police detective who always wears a pin-striped suit, and is trying to track Ah Jong down. He and his partner go and tell Jennie who her new friend really is, hoping it will make her turn him in, but it doesn’t work. Instead, Jennie and Ah Jong still carry on the classic love story, and the detective and Ah Jong grow to like and understand each other, so that by the movies end, they can be fighting on the same side against the triad. Thr action scenes are the real reason to see this movie. There are a tonof them, with Ah Jong often seeming more like a super hero, (with his incredible aim even while jumping,) then like a real person. There’s the night club opening scene (similar to the restaurant opening in Hard Boiled,) a Church shootout closing scene, and then a ton of great action scenes in between, inclugjmg a dragon boat sequence. This is definitely some of the best Hong Kong gunplay action, but it’s nowhere near as good as what we get in Hard Boiled. That movie blows this one away on every level. For one thing, nearly everything about this movie feels like a cliche. The assassin who cares storyline is one that Chow Yun Fat has starred in time and time again. It’s pretty much the exact storyline of his American film debut, The Replacement Killers, where he didn’t want to kill a kid, and so instead of doing the job, he refused it and the new killers called in started coming after him. When you consider that The Killer features an injured kid who Ah Jong rushed to the hospital, you realize just how similar these movies tend to be. While the overall story to the Killer is more on the level of a simple love story than some of the better, straight forward or creative action movies, (like, say, the John Wick films,) at least this movie never loses ground with its characters. That’s something that John Woo started doing when he came yo America and began making movies over there. Broken Arrow and Face Off were both pretty dopey. And don’t even get me started on Paycheck, Windtalkers, or Mission Impossible 2. John Woo certainly fell from grace, after he made it big. I would’ve have liked to see him make a movie with Jet Li, (a different kind of Hong Kong action star) while they were both in their prime. By the time they made Red Cliff together, nobody cared. But we’ll always have The Killer and Hard Boiled as John Woos Mark of a legacy. These are the movies that pioneered the way, and while their storylines might not hold up so well today, their action most certainly does.